How To Keep Your Blog Updated! I love doing advice posts on my blog, nothing better than influencing or helping another person. If they help you please let me know, this is for fun and please don't take it as this is what you have to do. I love to share my experience so far and to have fun with my blog posts for you. I love mixing up my reviews with something different. Clutter Free Space: This might be an obvious one but for me the best part about feeling creative and feeling motivated is having a clear space to work. 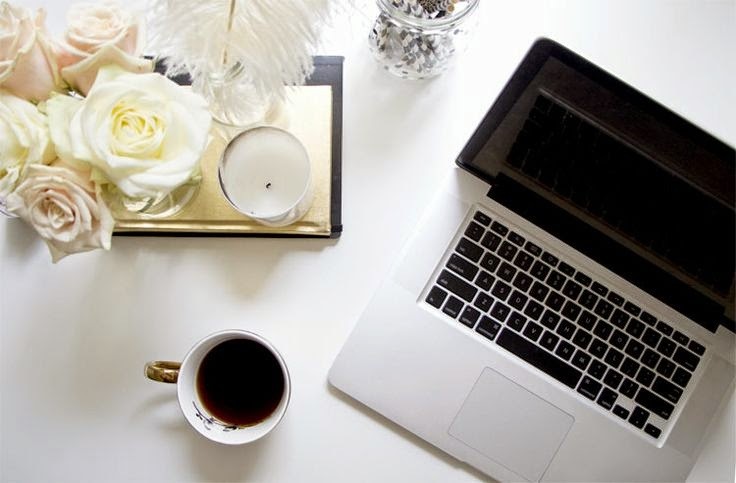 One day I will have a beautiful desk to work from just like this photograph from Pinterest. What I do at the moment with no desk is make sure my room or space around me is clean. I love to sit in a room that feels positive, nothing worse than your working space feeling cluttered. A clean room a clear mind I say, this helps me concentrate on new ideas and work on my blog. One day I will make a lovely designed office, one day! Photograph In Bulk: I make set days where I photograph all my ideas or products. I then make folders on my laptop labeled July, august etc. I then feel like I am organised to blog most days even when I work that day. I can then sit down late at night to do a couple blog posts for the next few days, I actually find that blogging helps me relax. Even if I am exhausted I still love to research or plan. Photographing in bulk really helps me to set out my blog posts for the week and with the British weather the light can work against you, so if you use a day that has great light it helps a lot. Cute Stationary: Do I need to say any more? What I love to do is plan everything out in a cute note pad. I love stationary shopping, now I am done with education I cant buy all the cute pencil cases etc but I can buy cute note pads, sticky pads and pens right? This helps me stay focused and I love to note down some ideas. I keep it all in my handbag when I'm out just in case I think of a great idea. Research: I love to read blogs, watch YouTube and read magazines. Its my favourite past time, this helps me feel focused and inspired. I feel as though other bloggers really influence my work on my blog, I find that seeing them as inspiration rather than competition works better. There is so much room for new blogs so give each other the support. I love to cut out things in magazines that influence me and stick them in my note pad. Content: Always write about things that you love, never force a blog post. If i'm not in the mood to write, I won't. I want every post to come from a good place and to be exactly what I think. I want to be proud of every single post I put up on my blog too. Never feel pressured to blog everyday, I have been blogging everyday lately but I just found that each day it flowed. Once I got into a routine it just stuck, this doesn't mean to say I have to put pressure on myself to do it now and never miss a day. Just go with the flow of each blog post and see how you get on. Have Fun: The main important part is to make sure you are still having fun. Remember why you started and just write to enjoy it. If it starts to get overwhelming take a small break and step back, go for a walk. I bet you will come back feeling so much better about it, its your space on the internet so enjoy every post. Photographing in bulk would probably be my number 1 tips as well. It's helped me so much! My problem is motivation. I have depression and find that sometimes blogging is a good distraction but other times I just can't summon the energy to blog at all.